Suscram Holywell Route - Suscram. 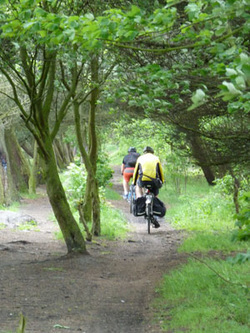 This trip to Holywell Dene is a fun family day out, the cycle is not hard but not too easy. Once in Holywell Dene there are some jumps for more experienced riders to attempt and lovely scenery for the perfect picnic if the weather stays dry! 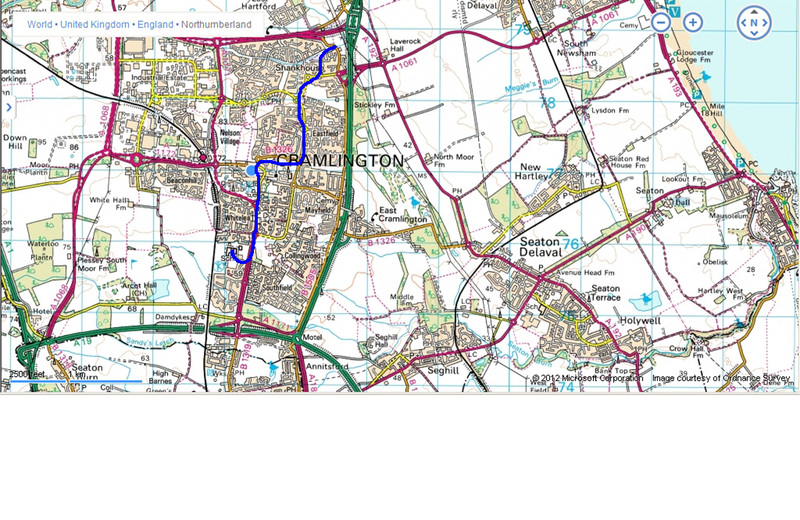 Set off from Cramlington Learning Village gates and turn right down the cycle track, and through the underpass. 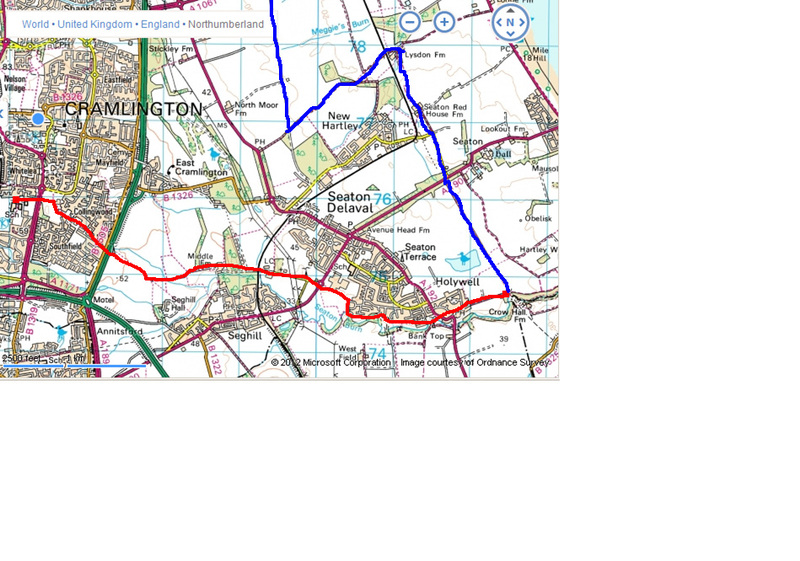 This track is the route of the Wagonway that connected West Cramlington Colliery to the Newcastle and Berwick main line. The hill on your right marks the site of West Cramlington Colliery. Passing Alexandra Hill playground on the right, carry on down the cycle path until arriving at The Bay Horse pub. Ride past the pub crossing the road and following the path under the underpass carrying through to the woods until reaching the big spoon. On arrival at the big spoon, carry on up the track until you come up to a three way junction. Take the left turn to head towards a small bridge over a small river. You then carry on over the river following the track until you reach a gate. You got through the gate and past some houses, go down a small decline and turn upon the wagonways track. Carry on down the wagonway until you reach the main road, on the other side of the road you will see a factory (Proctor and Gamble). Cross the road and cycle down the side of the factory reaching a housing estate. Stick to the path and cycle round the housing estate with the trees being at the right. Follow the path to the very end, eventually you will reach the main road (A192). Turn right onto the road and cycle past the pub "The Milbourne Arms". Take a left at the pub. Once at the end of Holywell Dene road, you should arrive at a gate. Pass through the gate and carry on down the cycle path until you reach a right turn into the trees which will take you to the main track through Holywell Dene (Avenue Branch Line). In Holywell Dene there are some jumps for experienced mountain bikers to try and when the weather is nice it is a nice place to relax and have dinner outside with your family. On your route back, go under the bridge and follow the track until you reach the A190. Cross over the road and cycle through St Michaels Avenue. Once on this path go right so you shall reach Seaton red house farm cottage. You cycle through this farm and cycle until you come to Lysdon farm. Then turn left and follow the track all the way until you reach the start of the dismantled Railway which should be on your right. Follow this track through the woods where there will be a lot of tree roots to avoid. Carry on until you reach a road which you will then cross until you reach the Golf Course. Cycle left along Plessey Old Wagonway. Then on your first right follow the path until you reach Low Horton Farm. Carry on along the cycle path until reaching the Three horse shoes pub. At the pub junction turn left then take a right and follow the road until arriving at a small roundabout. Take a left at the roundabout then on your right there should be a cycle path leading into Northburn which you will follow. Follow the cycle path through Shankhouse and under the underpass with Eastlea school on your left. Keep going up this cycle track and turn left towards the next underpass. Cycle under this and past Burnside school on your left and keep following the cycle path all the way until Parkside hill. Once at the top of the hill, go over the zebra crossing and turn right after the memorial statue. You should be at a car park, cycle across the car park and turn left at the path before the traffic lights. Turn left at Seven Oaks childrens park and follow this cycle path until reaching the underpass near Alexandra park. 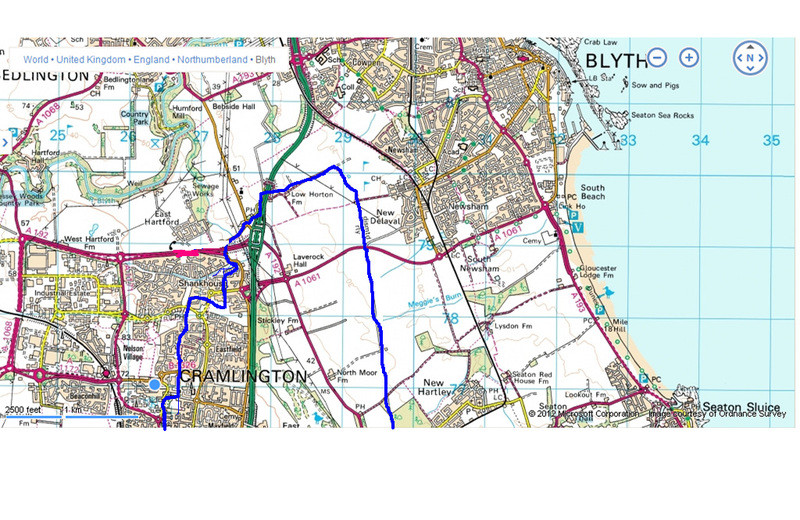 Follow this track and turn right at the park where you should reach your final underpass before reaching Cramlington Learning Villlage where you started your cycle.